Geomagic Capture enables designers and engineers to incorporate real-world objects into CAD as a seamless part of their engineering workflow. Geomagic Capture for quality inspection delivers precision scanning integrated with Geomagic's high-quality inspection tools in a seamless, push-button manner. The compact, ultra-light blue light LED scanner is combined with 6 application-specific software configurations. Convert 3D scan data into high-quality feature-based CAD models with DesignX’s combination of automatic and guided solid model extraction, incredibly accurate exact surface fitting to organic 3D scans, mesh editing and point cloud processing. Plugs directly into SOLIDWORKS environment for advanced capabilities to make tools, point clouds and polygons more usable in the design process. Supports a range of popular 3D scanners and can import standard point and polygon files. Comprehensive, robust and accurate 3D metrology solution and automation platform, delivering accuracy, speed and comprehensive, automated reporting on the quality of as-built parts for first-article inspection, production inspection, and supplier management. A new way to capture and remember the important events of life is here. 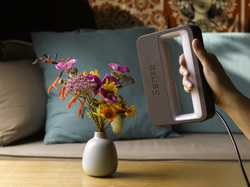 Whether it's a wedding, graduation, holiday or special occasion, turn your experience into physical photography with the Sense 3D Scanner. Merge scans easily with the Sense 3D Scanner software to edit, create mash-ups or organic models. Sense 3D Scanner is fully integrated with the Cube series printers so you can print scans directly in a variety of materials and colors.